Canadian Wildlife Federation: How can I stop Black Bears from coming around my property? How can I stop Black Bears from coming around my property? 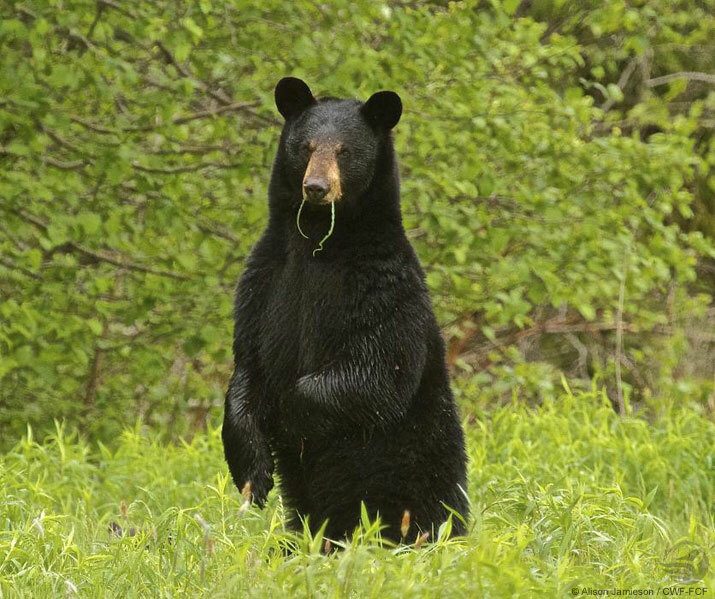 If Black Bears are visiting your property looking for an easy meal, it’s important to stop this behaviour before they get used to any tasty hand-outs! If you have close neighbours, ask them to do their part too. After all, it’s important to keep our wildlife wild. Keep your garbage inside a secure shed or garage until your collection day. If you have a green composting bin provided by your municipality, keep this in a shed or garage if possible until the day of pick up. If you have a compost pile, turn it often and cover it with leaves or soil to reduce the odours of your kitchen scraps. Click here for more information on composting. If you have fish and meat to add to your compost or garbage, freeze it and put it in your compost or garbage on your collection day. These particularly smelly foods will be sure to attract a bear if left in your bins for too long. Rinse out your recyclables and if you keep your recyclables outside be sure to use enclosed containers. If you have fruit trees, pick any fruit as soon as it is ripe and pick up fruit that has fallen on the ground. I know you won’t have any fruit in early spring but you never know when a bear might decide to come for a visit! If you have pets, feed them inside and store pet food inside too. Make sure to clean your barbecue grills and dripping tray. It’s also a good idea to store your barbecue in a secure shed when not being used. If you have a bear around your property, take down your bird feeders. If it is spring, summer or fall, your feeder birds should have lots of insects, seeds and fruit to feed on. These are all good habits to practice and will help reduce the chances of a Black Bear being attracted to your property!